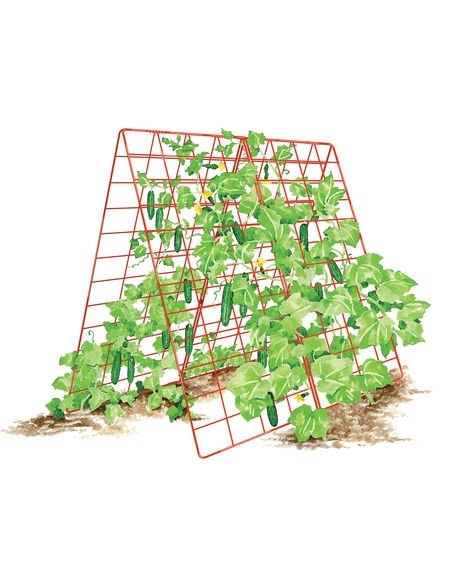 Cucumber Trellis from Gardener’s Supply Co. When we first grew zucchini a few summers ago, we discovered it was greedy in our garden box and tried to muscle out the other vegetables. Then we planted it in a giant barrel in an attempt to confine it last summer. That worked too well and we ended up without much produce. This year we decided to grant its place back in the planter, but give it a proper trellis. Mama and I found this lovely big red trellis online, which will allow the zucchini to grow and hang down inside the A-frame. Our cucumber plant, which turned out many wonderful cukes last year, but struggled on its tiny wooden trellises, will also get a new red trellis. The two crawling plants will grow on matching trellises on either side of our garden box with nasturtiums and marigolds in between as natural bug repellants. Today’s #OneGoodThing was assembling a solution for squash growing with Mama. What was your #OneGoodThing today? Please share in the comments! Day 79 of 365. And Day 1,175 in a row (here’s the first 366, & the following 365, & the third year of 365 good things)! You’ll have to do a panoramic shot one day, to give us an idea of the size of the garden.